The Stiebel Eltron heat-pump water heater is manufactured in Germany. 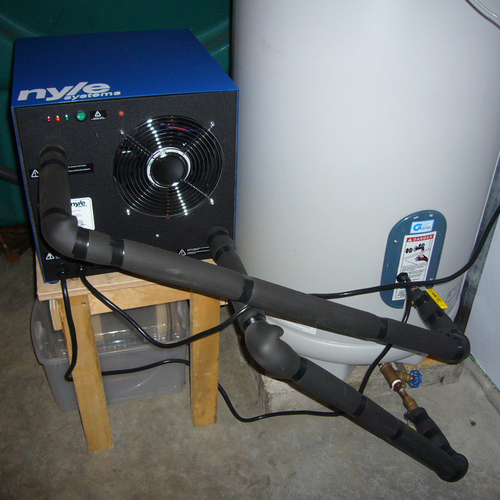 I’ve now had a year with the Geyser heat-pump water heater (HPWH). With the exception of the puddle on the floor in July 2011, it has performed consistently. Its performance has not been thrilling, though. In the summer, it was making hot water at about 0.13 – 0.15 kWh/gallon, with incoming water in the mid-60°Fs and basement air temperature around 70°F. In the winter, with basement temperatures in the low to mid 50°Fs, and incoming water at 50°F or a bit below, this consumption ratio increased to 0.25 kWh/gallon. I switched to using only the upper electric element in mid-January 2012, and the consumption ratio was 0.31 kWh/gallon, so the HPWH was saving about 20% — actually more, since the HPWH was heating the entire tank, and the electric element only was heating the upper 30% of the tank. This was verifiable by the way with the infrared camera — a sharp temperature gradient below the element location. If I didn’t give myself the flexibility with the 85-gallon tank to do the HPWH or add solar thermal hot water I would have installed a 50-gallon Marathon instead. We have very good data from the Eliakim’s Way homes that show about 0.21 – 0.23 kWh/gallon. So over a year I’m not sure my HPWH and the larger tank saved me anything over a smaller electric water heater. One very significant factor is our very low hot water usage of about 13 gallons/day. This means that the HPWH spends a significant portion of its operating time working against the standby losses, which means that it’s cycling in the 110°F – 120°F water temperature range, where it is least efficient. And of course that energy is not being used to heat hot water to replace hot water we’ve used. I have data on another HPWH, the . It was installed late this past winter in a deep energy retrofit that South Mountain Company did on a small house in Chilmark. The basement had about R-20 walls and an R-3 floor. There is a ducted minisplit heat pump air handler and insulated ducts in the basement as well as the Stiebel Eltron. The Stiebel Eltron has an 80-gallon tank which has the refrigerant heating coil wrapped around the outside of the tank beneath the insulation. It has a 1.7-kW backup electric element with a separate thermostat. This unit was set to make 130°F water. We installed a water meter on the cold water inlet and measured the electrical usage with the . Over the first six months, the household averaged 45 gallons/day of domestic hot water usage. As in other Martha’s Vineyard homes, the incoming water temperature varies, starting at 50°F in early March and rising into the low 60°Fs in August. Basement temperature began in the upper 50°Fs and rose to the upper 60°Fs. The HPWH made 7,980 gallons of hot water and used 477 kWh of electricity, a consumption ratio of 0.060 kWh/gallon — over three times more efficient than the 50-gallon Marathon tanks at Eliakim’s Way, which used 0.20 kWh/gallon over the same months in six houses that averaged 43 gallons per day. This performance is in a whole other ballpark than that of the Geyser. Also, the unit seems to have low standby losses. On days with no usage it was using about 1/2 kWh. My biggest question is, how long will this expensive device (the list price is about $2,600) last? 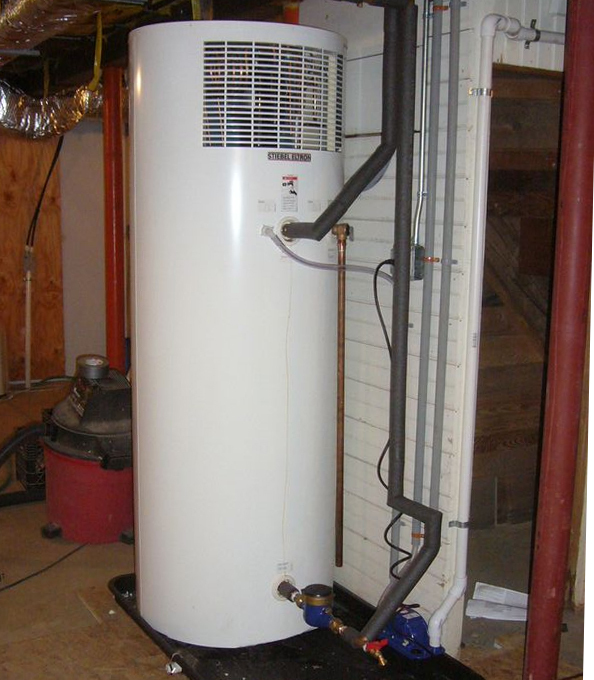 Where does a heat-pump water heater make sense? 1 – The HPWH is in a basement with a gas furnace and leaky uninsulated ducts that keep the basement at 70°F. The HPWH is operating efficiently because it is taking heat from nice warm air, and that heat is only indirectly getting to the living space. Probably a good application. 2 – The HPWH is in the thermal envelope of a direct gain passive solar house with a wood stove backup. Again, the heat pump is operating in a favorable temperature regime, and the source of the heat is either the sun or firewood. And often during the winter the space may be overheated and the cooling is not objectionable. 3 – The HPWH is in the thermal envelope of an electrically heated house. Each unit of energy removed from the air is replaced by electric resistance heat. Not a good choice. 4 – The HPWH is in the thermal envelope of a house heated with minisplit heat pumps that operate at a COP of 2.5. The HPWH COP of 2 is effectively reduced to 1.4 because of the energy required by the heat pump to offset the cooling effect of the HPWH. If the house is in heating mode for six months of the year, and the rest of the time the cooling effect of the heat pump is negligible or welcome, then this changes to 1.7. And finally, the more the climate shifts towards being cooling-dominated, the better the HPWH looks. A HPWH in your house in Florida supplies free cooling and dehumidification as it heats water. The other thing we’ve learned with the Stiebel Eltron HPWH is the effect it has on the basement humidity. We know a HPWH will both cool and remove moisture from the air, but we didn’t know if it would make that air higher or lower relative humidity. It could possibly cool the air and not remove enough moisture to keep the relative humidity from rising as the air was cooled. Image 2 (below) shows data recorded during a 3 1/2 hour run of the HPWH, and the conditions of the air at the start and the end. What we see is that the basement both cools and drops in relative humidity. As my friend and South Mountain colleague John Guadagno says, good stuff, good stuff! The reason it’s good is that the moisture content of materials is based on the relative humidity of the surrounding air, and lower moisture content means lower opportunity for mold. I agree with JG! 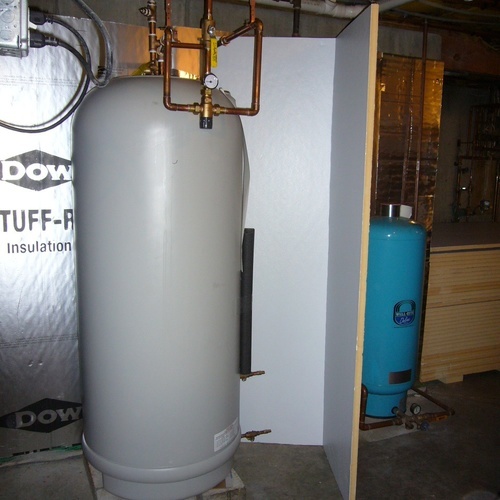 – Medium DHW users, say 20 – 50 gallons/day, should consider a heat-pump water heater. Pick the highest efficiency and one with a large tank, which keeps the electric backup off. – Large users of DHW should consider a solar thermal system. Look at the , which is a clever packaged drainback system, as one possibility. Up north, a standard value for water heater temperature rise is 90*F. That figure contemplates fairly stiff conditions such as 35-45*F entering water and 125-135 leaving water. Even up north, 70*F rise is probably more reflective of typical home needs. Splitting the difference, consider an 80*F rise: A pure electric resistance heater operating at an EF of 0.9 would require 0.217 kwh / gallon. I'm surprised and skeptical of data that the Geyser uses 0.25 per gallon and that the Stiebel uses just 0.06. The two systems simply aren't that far apart as to design. Your epiphany relating to basement humidity is not all that suprising...trick question...what is the relative humidity of air discharged from an air conditioner operating in a humid climate? Answer: pretty near 100%. You might ask how can supply air at near 100% RH possibly dehumidify a room or home. You might even ask how air just discharged from and AC (doesn't matter what kind - window, central or minisplit) has an RH of 100%...answer,,,it just blew across a cold wet coil covered with water droplets, so it is plenty wet. 55*F 100%RH air is still an excellent dehumidifier. You might be tempted to ask how that could be. The answer is that 55*F 100% RH air when mixed with 75*F+ air becomes a mixture with sub 50% RH. I'm not surprised, and I hope YOU are not surprised that a family whose hot water tank capacity is 5x daily hot water usage experiences very high standby loss relative to daily use. I believe you have concluded what I postulated a couple weeks ago...that a household with very low (<20 day! hot water use in the 15-25 gal/day range. Super insulated, net zero ready with one mini-split for heat & cooling. The thing that bothers me the most about this concept is using electric resitance to heat water! While I love reading about the newest, greatest thing in solar hot water or heat pump water heaters, with useage of 15-25 gal/day, the payback is measured in centuries. Also the HPWH would be a real problem in a small space in the heating season. Drain recovery might make economic sense, but typically I am building on a slab or shallow crawl space. 1) Electric 30 gallon tank wrapped with two inch pex supply line, then wrapped with additional insulation and then wrapped again with 2' pex supply line. My plans all have all plumbing together so the hot water tank would be sharing space with refrig and washer dryer. Incoming water 50deg would heat to 70deg in outer coil which would heat to 80+deg in inner coil. So water entering electric tank would be at 80-90deg, instead of 50 degrees. Each coil would be about 10-12 gallons so I would have 20+ gallons in preheat. Tank standby losses would be preheating water. 2) Set a steel pressurized preheat tank in front of the inactive panel of a south facing sliding glass door. The tank would be insulated on all sides but the one facing south and would have movable night insulaion for the exposed side. At the end of a sunny day, I would have 90-100 degree preheat water. "1 - The HPWH is in a basement with a gas furnace and leaky uninsulated ducts that keep the basement at 70°F. The HPWH is operating efficiently because it is taking heat from nice warm air, and that heat is only indirectly getting to the living space. Probably a good application." Thank you for this good sense comment. An obvious point, but not to everyone, apparently. I agree that availability of nat gas coupled with a northern climate weakens the case for HPWH in all but the cheapest electric utility territories. 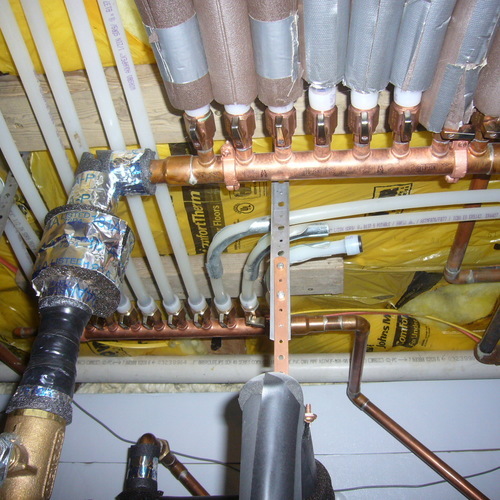 As painful as it is to use electric resistance for water heating, consider another extreme - keeping an oil-fired boiler and its hydronic jacket, flue, etc hot all summer (as well as driving unwanted heat into the surrounding room and home) just to have hot water. Circumstantial evidence suggests standby losses in that situation exceed 75%. Had trouble with the "all electric house"
Until I started focusing on very small homes with typically only one person, I avoided all electric. But when the demand drops to a certain point and COP for electric heat goes to 2.0+, the numbers change. One of the things I like about designing/building small is how simple everything gets. 75% standby losses in water heating would be the extreme case in an oversized high-massboiler, but 50% would be better than average for an embedded coil. The fact that old-school high mass boilers have little or no insulation, along with the fact that most real-world installations don't have adequate (or even any) insulation on the near-boiler plumbing, which takes standby losses through the roof. Some of these situations can be rectified, others not. But getting off oil and onto heat pumps makes ever-better economic sense, and in most of the US it's dramatically lower-carbon to go all-electric if done with heat pump technology. The state of the art of air-source ductless systems have soared over the past decade, and even in New England it's possible to economically offset a large fraction of the heat load in most oil heated homes with a $5K 2-ton mini-split, even if it's not a total solution. Marc Rosenbaum was able to heat his better-than code pretty-tight house on Marthas Vineyard with a 1-ton Fujitsu and truck the oil-boiler away, but for most downeast Maine retrofits you'd probably still need to keep the beast alive, just less active. In order to speak of standby losses in an oil boiler one would have to know what standby losses are in other systems. The only problem with Marc's kw per gallon number is the lack of a standby loss number. Knowing a given systems standby losses gives one a basis of comparison between systems. Marc does not list this if he has measured it. Knowing the standby number and comparing it to the standby losses of other systems, one can make a judgement as to their relative performance. I recently posted my standby loss experiment for my own oil boiler indirect system. If I bothered to measure my actual hot water usage, I could then make broad assumptions about relative efficiency. The labeled DOE EF rating for heat pump water heaters (HPWH ) and other standard water heaters does in fact give the standby losses under a standard set of conditions & use volumes, and the absolute standby can be derived with reasonable accuracy via simple arithmetic with few assumptions. The daily volume used (64.3 gallons), the incoming water temp (58 ± 2 °F), and the storage temp (135 ± 5 °F) is specified in the test, protocol, as is the room temp (67.5 ± 2.5 °F, dry bulb) where the water heater is located. From an EF rating it's pretty easy to derive a standby loss number in BTU/hr or BTU/day that's good for better than 1.5 significant digits under the standard test conditions, and adjust it for your actual storage temp and room temp delta-Ts. With a cold-start boiler and a well insulated indirect with the pipes insulated your standby loss on the boiler would be low, but those beastie-boilers with the embedded coils are going to cost real money even if you bathe only once/week with a bucket. For those heating with an embedded coil you went with a HPWH and turned off the boiler in the summer the cooling season savings alone would pay for a HPWH in short years at $4/gallon and $0.16/kwh, with an EF of ~2 at any rate of water use. OTOH the money might be better spent applying the water heater costs to a ductless air source heat pump for supplemental space heating in terms of raw ROI. truly useful. The industry numbers don't apply to very low use as I see it. Good stuff - thanks, guys! I've done the math Dana references for back calculating the standby loss of water heaters with labeled EF and kwh usage subject to the DOE / ASHRAE / WHAM test. 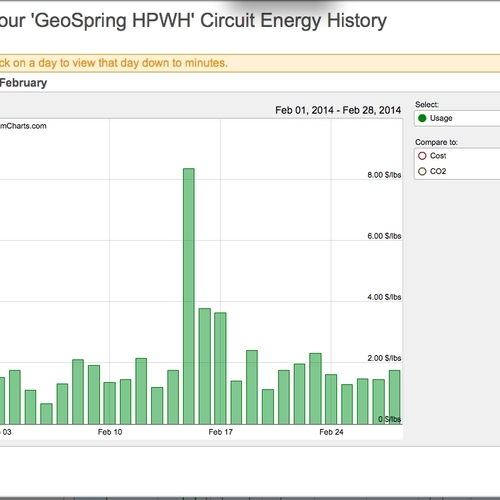 Per the test draw schedule for resistance heaters, any kwh usage above 4422.9 per year is standby loss. I skimmed the report and it seems to support my supposition that summer domestic water heating using an oil boiler is REALLY inefficient. Mom lives alone in a 3000 SF home north of Boston. It has a Weil McLain Gold boiler with, I believe, an 0.8 gph nozzle. Per the oil company, the house loads out to 55k btuh, making the boiler about 2x oversized...typical, I guess. Every year they test the thing and hang a tag claiming 84-85% efficiency based on net stack temp gain and O2 or CO2...I don't remember the details, but dimly recall an internship around 1987 where I went 'round with a smoke tester, flue thermometer and Bacharach dumbell which purported to return a combustion efficiency percentage. At any rate, Ma lives alone and is quite frugal with space heat, shutting it off in early spring and using none as late as possible in fall. Yet each summer she goes through an expensive half tank or so (100-150 gallons) of fuel oil which can be attributed solely to domestic hot water for 5 months. The boiler is warm all summer, as is a labyrinth of connecting pipes and zone pumps (3 + indirect). Standing on the flat roof 3 floors above the boiler and peeking down the 9x12 terracotta lined flue, one gets a faceful of upward moving, warm, oily smelling air...for 5+ straight months. I've insulated some of the labyrinth, which seemed to reduce cellar air temp somewhat, implying I've reduced standby losses. Regardless of my efforts, this has got to be the most hare-brained scheme for keeping Ma in hot showers from May through October. I asked the oil heat outfit about shutting off the boiler for the summer in favor of an HPWH or even a resistance tank (oil $3+ per gallon, electricity $0.16 / kWh, thereabouts), but they assure me the boiler will die of cold, acid rain, or idleness. I think they are just trying to keep feathering their nest with that 100+ gallon annual summer fuel burn. Nat Gas is available, but it is 200' away across exposed granite ledges in woods - god knows what that would cost to bring in. Electricity may be expensive but it aint that expensive. You can absolutely turn off the boiler in the summer. Just arrange for the annual cleaning to be in the fall at turn on time. In the crudest-estimate of standby loss, if you had a best-case 75% efficiency system at DOE usage profiles, if your personal use profile is zero gallons you're still using 25% of the oil that it takes to use ~63 gallons/day, which is still pretty substantial. Even the cold-startable 92% condensing oil boiler with an indirect (system #4) was only pulling 55.4% water-heating only efficiency, which means a 1 gallon/day washcloth-bather would be using almost half as much oil as a 63 gallon/day family. Even a resistance electric tank rated at 0.90EF would beat it on summertime operating costs at the current national average oil & electricity rates. Heat-purging the boiler and reducing the standby loss on of the indirect by better-insulating the pipes is about the best you can do with oil, and I'm sure using a heat purging economizer control even as a retrofit would put some cold-start boilers north of 75% in water heating mode, but turning it off an using a heat pump water heater is clearly a better way to go in summer. In Curt's Mom's MA location summertime dew points are well north of 60F, and even reasonably tight homes benefit from basement dehumidifiers in summer. A HPWH would take at least some of that latent load and apply it to the better use of heating hot water instead of heating the basement air. (And at MA levels of subsidy the HPWH hardware is basically free, installation extra.) Most boilers built after 1980 will not have issues with turning them off seasonally. If it leaks when cold it's an indication that either the through-bolts on the heat exchanger plates have stretched (and it may be repairable with a wrench) or the plates have warped or corroded to the point where it's already on it's last legs anyway. This was my original point[to get back on topic] that if in an installed situation one were to measure standby losses[ zero gallons energy use], then measure hot water use and energy use, then one would have a pretty good guess as to what it would cost to run a given hot water heater at various use levels, since the standby losses are relatively fixed. It is really the only thing that is missing in Marc's article to be able to compare apples to apples. In Curt's mom's case, I think I would want to know how much total oil she burns before selling her a hpwh. Spending several grand on that and leaving that boiler in place seems dicey. The "75% of what" comparison is in the document. The distribution of water use volume is graphically outlined on p.4 of the document, and is about the same total volume as in a DOE EF test, but uses a different draw profile than the EF test. Independent of the draw profile the standby loss doesn't change much, so if in the best-case system (system #3) 75% of the source fuel energy went into the hot water, on that system with ~87% steady state efficiency, 12% of it went up the flue (88% raw combustion efficiency) and 12% of it was standby loss. So an extreme near-zero-volume user would still use 12% of the the fuel used by the standard- volume user. (I mis-stated it in my prior post as 25%, not accounting for the raw combustion efficiency of 88%.) And that's the best-case system- only one other even beat 60%, independent of combustion efficiency or steady-state efficiency. In Curt's mom's case the state of MA will kick back $1KUSD in direct cash subsidy, which is the retail price of the GE unit down at the box-stores. (With the subsidy it's substantially cheaper than a standard electric tank- it's essentially FREE. The state is being THAT aggressive about it!) I'm not quite sure how the rest of plumbing & electrical for installing it could add up to "several grand" or even a single grand by contractors who aren't just out to rip off an ol' lady. If her system is is one of those 55%ers (or worse) her summertime oil use will be substantial at any (or no) hot water usage. If it saves even 50 gallons/summer (plus 200-500 kwh on reduced dehumidifier operation) it should pay back in short years. But if she's playing a short-termer's game and figures she'll move out or shuffle off the planet soon there's no payback in any of it. The report, like most such things, is intended to compare amongst the items tested. It states as its purpose to investigate the improvements to be had by updating this type of equipment, not to come up with absolute efficiency numbers. As such, the 75 percent number is not a valid number to use for comparison outside of the experiment. Remember the numbers you are quoting are summer numbers, and the heating system, here in mass is at least 8 months, and there is a significant buydown with regard to standby losses in the winter, which is why people are not ripping out indirects to put in resistance tanks by the thousands. I take it you have not hired a plumber and electrician recently? To add a new component where one was not previously, wire it etc is non trivial. No I do not keep track of incentives, but yes, if the hpwh is 'free' I would bet it was a grand to install. That just might be a good investment in Curt's mom's house, but the real question remains is it the best investment in energy savings for the house[aside from buying a cool piece of technology]? Without knowing what the house is spending on utilities, and what the longer term plan is I could not venture a guess. If spending a good chunk of change on improvements will keep her living in the house for many more years, then it is within the realm of possibility that getting rid of that damn boiler is completely possible. Then by all means get a 'free' water heater. If, however, there is not such a budget[and/or she secretly wants to make the move to Boca and has not informed Curt yet] then that might change that math. HPWH are still on the 'newish' side and I can think of few things I would want less than a lot of calls about how that fancy water heater is broken, 'again'; from my mother! All good stuff - thanks! Momma's cheap and cold blooded - no heat until deep in the fall and then set points just 60-62. She visits Boca (Delray, actually, but close enough) but beats feet up I-95 the moment dewpoint reaches 60, no later than May Day. I didn't realize Mass has HPWH rebates - good info. I'd like to see her go for the Nat Gas and get rid of the oil boiler and tank. The case for an HPWH weakens with NG. As much as I dislike them, an NG tankless probably makes sense for her, decoupling space heat and hot water.